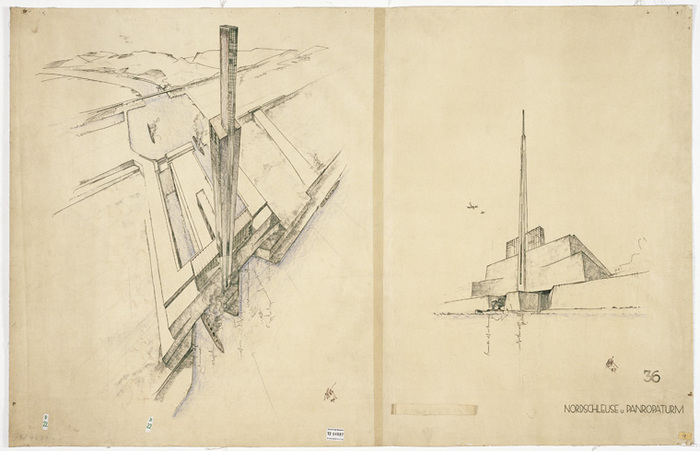 Herman Sörgel, infrastructural masterplan for Atlantropa, 1932, Munich, Germany. Courtesy of the Sörgel-Archiv, Das Deutsches Museum, Munich. 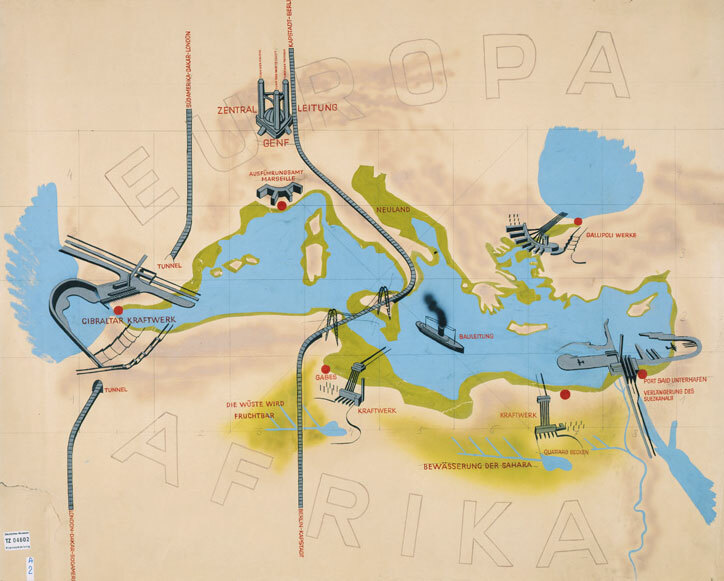 This dissertation follows several generations of German architects, engineers, planners, and scientists, across Central Europe and colonial Africa, whose work gave shape to new forms of technical expertise through involvement in internal and external colonization projects and housing programs. 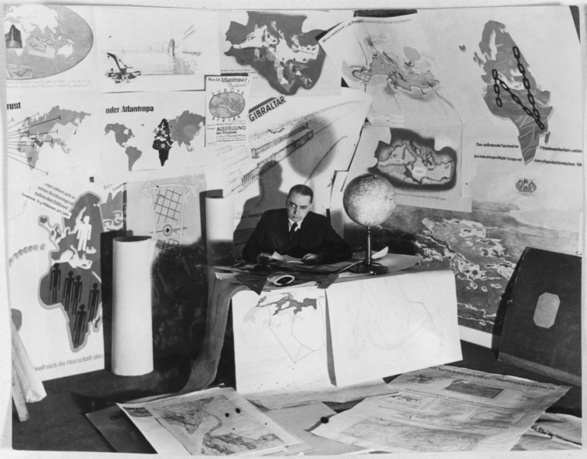 It argues that a new and enduring “rule of experts” developed within the circuitry of certain infrastructural technologies—colonial camps, settlement commissions, housing estates, transnational networks—that shaped an image of the modern architect as an intervention-oriented planner. The project explores the spatial politics of the social reform movement of the 1880s and its legislative legacy—from coercive tenancy laws, to the development of colonial infrastructure, and land-use policies—and tracks its influence on the cultural logic of avant-garde housing estates. In drawing such an arc, this study demonstrates how architectural technologies shaped an infrastructural network of European power, and reframed the relationship between the body and the state. Hollyamber Kennedy is a PhD candidate at Columbia University's Graduate School of Architecture, Planning and Preservation. Kennedy holds a double BA in philosophy and art history from the University of Massachusetts Amherst and an MA in art history from Columbia University. Her research focuses on the history of modern architecture, the politics of land reform, urban design, colonial building programs, and transnational infrastructural networks in Central Europe and German colonial Africa. In addition to the Carter Manny Award, she is the recipient of the Deutscher Akademischer Austauschdienst Doctoral Research Grant, the Buell Center Fellowship for Historical Research, and a Doctoral Fellowship from the German Historical Institute. Among other texts, Kennedy is the author of "Untimely Meditations and Other Modernisms: On the Glass-Dream Visions of Bruno Taut and Paul Scheerbart," featured in Glass! Love!! Perpetual Motion!!! A Paul Scheerbart Reader (University of Chicago Press, 2014).